For the last couple of years, 1920s inspired drop waist dresses were all over the runways - from Victoria Beckham, Etro, Chloe to Proenza Schouler, Isabel Marant, Valentino, Chanel and Dior, pretty much every other designer out there included this silhouette in his/her collection. The actual drop of the waist may vary from just a couple of inches below the natural waist to much more for a more “dramatic” look. I think the drop waist silhouette works especially well for a more boyish figure and can be particularly flattering for women with a less defined waist. When I first saw the Malvarosa designed by the talented Pauline, I fell in love with it - it’s a shift drop waist with an interesting drop shoulder (actually sewing the sleeve to the drop shoulder (at an angle) is the most difficult part about making this dress) an pockets! I love pockets! The only thing that I modified a bit were the proportions - the length of the sleeve, the drop of the waist and the overall length. I lined the entire bodice and therefore I did not used facings. To hold the lining from showing I under stitched it at the neckline and at the edge of the pockets. This is my first attempt at plaid matching and maybe it’s not perfect but I tried my best and I’m quite happy with the result. Mods: I modified the proportions, lined the bodice and eliminated the facings. A note on the leggings: I used the Burda Lace Leggings pattern and a coated cotton lycra blend jersey to make them. I know the “leather” look leggings trend passed its peak but hey … it took me less than half an hour and 6€ to make them. I love this dress, I love the drop waist silhouette and I’m looking forward to experiment with it some more. Da due anni a questa parte, quasi tutti i designer da Victoria Beckham, Etro, Chloe a Proenza Schouler, Isabel Marant, Valentino, Chanel e Dior hanno presentato in passerella una qualche interpretazione del vestito a vita bassa inspirato agli anni venti. La “caduta” effettiva del punto vita può variare ampiamente da un paio di pollici a molto di più per un effetto più “drammatico”. Personalmente penso che il vestito a vita bassa dona molto sopratutto a figure più androgine e a donne senza un punto vita molto marcato. Mi sono innamorata del vestito Malvarosa dal primo momento in cui l’ho visto - e un vestito “shift” con una costruzione interessante (“drop shoulder”) della spalla e tasche. Adoro le tasche! L’unica cosa che ho modificato sono le proporzioni - la lunghezza della manica, la “caduta” del punto vita e la lunghezza totale. Ho foderato l’intero corpetto perciò non ho dovuto usare paramonture nella scollatura. Ho impuntato internamente (“understitching”) la fodera sulla linea dello scollo e sulla linea delle tasche per costringerla all’interno. Questa è la prima volta che provo a far combaciare le righe del plaid - non è venuto perfetto ma ho fatto del mio meglio e sono piuttosto contenta del risultato. Mod: Ho modificato le proporzioni, ho foderato il corpetto e ho eliminato le paramonture. Nota sui leggings: per farli ho usato il cartamodello Burda Lace Leggings e un stretch misto cottone lycra spalmato. So che il look “pelle” nei leggings ha magari superato il suo apice ma visto che ci ho messo solo 6€ per il tessuto e mezz’ora per confezionarli penso possano anche andar bene. Adoro questo vestito e non vedo l’ora di sperimentare ancora con questa silhouette. I love this dress and I love your style! This dress is AWESOME! I love the pattern I love the shape I love the fabric and i love your pictures! Thank you so much Ute, I'm so glad you like it! 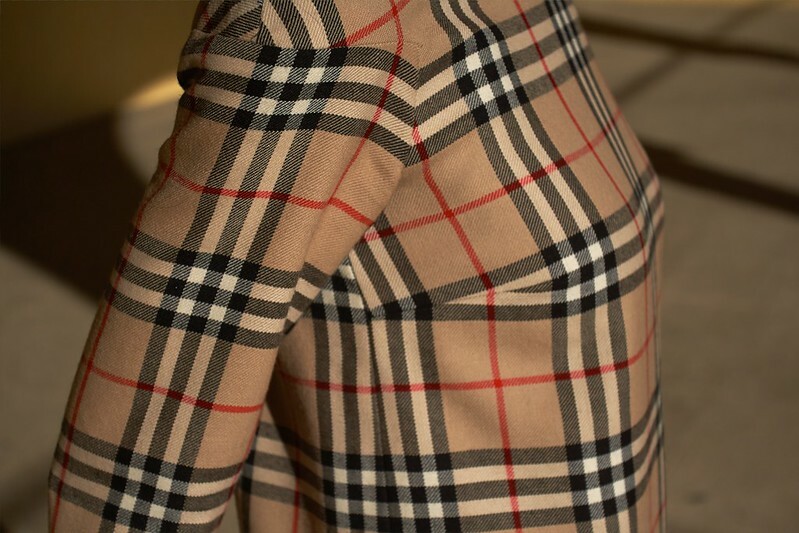 This is a great burberry - esque drop waist. This is a great pattern and it's wonderful to see it made up in tartan. Those leggings are a winner! This Malvarosa is one of the best posted on the net. Great job at matching plaids and adjusting proportions! With so many great Malvarosas floating around the blogosphere yours is a very nice compliment! Thank you Hélène! Bellissimo vestito!!! E ti sta veramente bene! Sei stata davvero brava a far combaciare le righe, complimenti! Grazie Tiz! Si ho visto il tutorial di Coletterie - in fatti ho usato più o meno lo stesso metodo (che penso sia il metodo più logico) ed è per questo che non ho raccontato come ho fatto - niente di speciale serve solo tanta pazienza! Sasha, la tua precisione e' incredibile! Ho colto l'occasione per fare un po' di browsing tra i tuoi vecchi post e sono rimasta ancora piu' a bocca aperta! Anche un genio della maglia...i tuoi calzini sono davvero belli...per non parlare delle foto divertentissime e delle illustrazioni. Complimenti davvero. All-round artist! ... un genio della maglia!!! :D... grazie mille Silvia sei troppo gentile ed io sono senza parole! Non è venuto perfetto?!?!?! Io l'ho visto dal vivo ed è un capolavoro! Belli anche i leggings! Confesso che anche a me piace molto il look "spalmato" nonostante sia già un po' passato e mi piacerebbe farmene un paio da portare come collant, specialmente se a un prezzo contenuto come quello che hai trovato tu! ahhhh... quei 2mm nella ripresa al seno mi urtano il sistema nervoso ... e poi non capisco perché le cuciture sopra le spalle non sono perfettamente identiche!!! Grazie per le tue parole ... dette da te poi significano tanto! ps leggings: scampolo giusto (anche se un po corto ;) al momento giusto - avevo appena visto sul sito di asos un paio simile a 20+ ! Lovely placement and use of the broad stripe in the bust dart, I enjoy your blog, thank you! Thank You Jeannie!!! it's so nice to know people appreciate your work! Sasha, complimenti per il vestito! Ti sta benissimo! E quei leggings! Stupendi, anche se non avrei mai il coraggio di indossare un paio simile :) Bravissima, come al solito! Grazie Mary! il cartamodello è molto bello e a parte la complicazione della manca e molto facile da confezionare! I leggings sono un po fuori carattere anche per me - giusto un pochino, forse perché non vivo esattamente in una metropoli - ma chi se ne frega!!! You look so elegant in this dress! The plaid matching looks perfect. Thank you Emily!!!. I actually think that adjusting the proportions and experimenting with different fabrics this shape would work on lots of people. Basically if you can wear a shift you can wear this! This is why a love sewing and generally garment making - it's creative and you get to experiment and if it doesn't work - well ... you had fun and that is the point isn't it? Sasha it's just so great! It's not a style I could wear myself but on you it is fab. Those sleeves are so interesting - are they comfortable to wear? I'd be tempted to get the patten just for the sleeves and use it as a straight shift or top...... You've done a great job on matching your checks too. I agree with the comment it's the best one I've seen - the tartan elevates it from being a little girly to being very chic. Thanks Sasha - I'll add it to my never ending list! It's wonderful, such a great style for you! The plaid was such an inspired choice of fabric, and does a great job of accenting those interesting sleeves. Thank you so much Sara! maybe the most difficult part in matching the plaid was deciding which line to keep on the sleeve - I'm glad it works! Sasha I love this is on you, it's divine! I agree that the drop waist looks best on tall lean silhouettes. I dream of a drop waist, but on my pear shape it's a disaster. You look gorgeous! This looks fantastic. Despite what you wrote, I think you did a great job with pattern matching. Looks good to me! Thank you Maddie, I'm glad you like it! There are some imperfections like the 2mm you can see in the bust dart - that I find annoying, I know other people wouldn't notice but I know it's there!! Wow, I don't think I've ever seen a drop waist look so stylish! I love those sleeves; the dropped shoulder seam is a really interesting design line. It's a really lovely dress on you - I'm sure you'll get many happy years of wear out of it! Thank you so much Danielle! I do love the cut of the sleeves!!! Bellissimo, a me viene l'orticaria al pensiero di dover far combaciare righe e quadri! Bellissimo!! è perfetto e ti sta da dio! Brava brava! L'allineamento delle righe mi sembra praticamente perfetto...io invece non sono ancora riuscita ad allineare bene nemmeno le cuciture...ho appena finito un vestitino e ancora non ce l'ho fatta. Ma ci riuscirò prima o poi ;) Stupende anche le foto, sono perfette! Non ci credo, guarda ... ho visto la tua Mathilde dal "vivo" ed era perfetta ... Non vedo l'ora di vedere il vestitino! Thank you Annika ... Maybe I'm a little prone to exaggeration but when you spend hours to get the lines to align perfectly and you sew and you turn and they are a couple of mm off ... steam starts coming out of your ears and when you look at it it's all you can see! It's wonderful !! A great style with this fabric, and gorgeous photos !! Thank you! ... this leggings pattern is definitely my favourite !!! Hot, Hot, Hot!!! You hit the ball out of the park with this one. Plus your plaid matching is pretty perfect. Thank you so much Christina ... so nice discovering your blog! Sasha! These photos are straight out of Vogue!!! Dress is gorgeous & you look amazing in it. Thank you so much Ebony!!!! :D... coming from a stylish gal like you means a lot :D!!! Sasha, I totally agree with the others that yours is the best malvarosa out there! I would love to make one like this. I am fairly new to sewing, having only finished a few dresses so far. Could you please let me know how you modified the length and sleeves? Love, love, love the dress and amazing photos too!